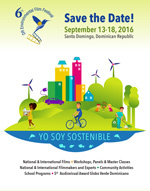 Under this year´s motto “Yo Soy Sostenible,” the sixth annual Dominican Republic Environmental Film Festival (DREFF) will kick off in Santo Domingo with the movie The True Cost on September 13th, 2016, accompanied by a big celebration of sustainable fashion at Palacio del Cine-Ágora Mall, in Santo Domingo. Don’t miss out on any of it! The winner of this year’s Green Film Network (GFN) Award – the Oscar of environmental filmmaking – has just been announced! Landfill Harmonic, the joint Paraguay/USA production directed by Brad Allgood and Graham Townsley, has been chosen from among nearly 20 competing films representing various other countries. DREFF is proud to be the first host of the annual GFN Award in the Americas. The film – screened during the opening ceremony of DREFF 2015 – will again run during this year’s Closing Ceremony on September 18 in Santo Domingo. The Global Dominican Academic Exchange Program (GDAE) is pleased to open the application period for the second consecutive GDAE, “The Yale Experience,” to take place October 9–16, 2016, at Yale University in New Haven, Connecticut. Applications will be received until September 16, 2016. Accepted students will be welcomed by their hosts, the Dominican Student Organization: QuisqueYalies, at Yale University. Send your application now! On August 31, the Global Foundation for Democracy and Development (GFDD) and its sister organization Fundación Global Democracia y Desarollo (Funglode) hosted a panel discussion on the importance of sustainable tourism for development in the Dominican Republic, as part of the official launch of the GFDD/Funglode publication “Challenges for Sustainable Growth through Tourism in the Dominican Republic” by GFDD Fellow Emma Fawcett. Several policy experts the from the NGO community and the Dominican board of tourism joined the report’s author to contribute to the discussion. The group of students of the InteRDom Summer Program 2016 lived an unforgettable experience on July 2 during their visit to the 27 Charcos del Rio Damajagua in Puerto Plata, Dominican Republic. This natural treasure has existed for thousands of years but was only recently discovered and is now one of the most visited tourist attractions in the country. For three hours the students, accompanied by InteRDom staff and lifeguards, toured the 27 Charcos and were immersed in different activities. First they traveled a path for about 45 minutes to the waterfalls, then climbed up to the 27th waterfall and came back jumping, swimming, and sliding down natural slides. The Fundación Global Democracia y Desarrollo (Funglode) and the Global Foundation for Democracy and Development (GFDD) have released a call for submissions in their 2016 Awards, now in their 10th edition. The 2016 Funglode/GFDD Awards will be given in the following categories: Essay, Journalism, Novel, Poetry, and Photography. The deadline for entries to this contest is October 3, 2016, by 4:00 pm. Works should be submitted to the Funglode offices in Santo Domingo (Centro de Estudios de la Cultura de Funglode, calle Capitán Eugenio de Marchena #26, La Esperilla, Santo Domingo, Dominican Republic) or to the GFDD office in New York (780 Third Avenue, 19th floor, New York, NY 10017, USA). The Dominican Republic Environmental Film Festival (DREFF), in collaboration with the DC Environmental Film Festival (DCEFF) and the Inter-American Development Bank (IDB), celebrated on July 27th the screening of the film Death by a Thousand Cuts at the E Street Cinema in Washington, DC. Before a full house that required the opening of two screening rooms, the movie’s codirectors Juan Mejía Botero and Jake Kheel and producer Ben Selkow discussed the film and expressed their hope that it would serve to call attention to the implicated parties and generate dialogue and transnational solutions between Haiti and the Dominican Republic. The Global Foundation for Democracy and Development (GFDD) and Fundación Global Democracia y Desarrollo (Funglode) are pleased to announce the 8th edition of the GFDD Golf Tournament, slated to take place once again at the prestigious Fresh Meadow Country Club in Long Island, New York, on Monday, September 26th. As a tradition, former Major League Baseball player and long-standing friend of GFDD Juan Marichal will be the Honorary Starter of the tournament. The event will feature the attendance of special guests, as well as the presence of former Dominican Republic president and current president of GFDD/Funglode, Dr. Leonel Fernández. GFDD and Funglode invite you to the event RD2044, a multimedia presentation showing the investigation procedure, the concept of the design of the research projects and the planning of the necessary infrastructure in the 32 provinces of the Dominican Republic in order to achieve the economic, social and human development of the country over the next 30 years. The Global Foundation for Democracy and Development in partnership with the United Nations Association of America (UNA-USA) Council of Organizations (COO), the Southern NY State Division of UNA-USA and the League of Women Voters will host a forum in conjunction with the release of a new study on Civil Society and Development, The new study by Vinay Bhargava and colleagues at the Partnership for Transparency Fund (PTF) summarizes major trends reflecting the growing importance of civil society organizations (CSOs) in international development. The event will give particular attention to how civil society organizations can help implement and monitor governance improvement actions in the United Nations Agenda 2030 for Sustainable Development (Agenda 2030), especially under SDG 16, at the national and sub-national levels. Finally, it will cover key lessons from PTF’s experience and challenges that CSOs are likely to face in engaging with national governments during implementation and monitoring of governance reforms under Agenda 2030, as well as ideas for helping CSOs address the challenges. PTF and COO welcome co-sponsors and/or discussants from the COO membership and the NGO/CSO community. Where: UN Church Center, 777 United Nations Plaza (at 44th Street, between First and Second Avenues), New York, NY 10017.